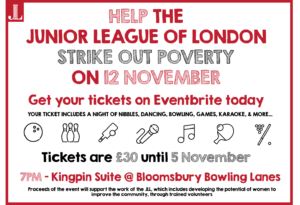 Join the JLL on 12 November at the Private Kingpin Suite in Bloomsbury Bowling Lanes (Entrance on Bedford Way, WC1H 9EU) for a casual evening of fun and socialising for a good cause! We will be holding a raffle with some fantastic prizes that you won’t want to miss! Whether you prefer bowling, karaoke, indoor cricket, shooting pool, playing video games, or dancing – this event is for you, your partners, your friends, and your colleagues! The party will start from 7 PM and continue until 3 AM, so bring your best game face, karaoke voice, dance moves, or all of the above! Tickets are only £30 (plus EventBrite fees), so get your tickets from here today and invite your nearest and dearest! Tickets include all entertainment, pizza, and canapés; a cash bar will be available on the night! Please note that due to licensing, this event is restricted to adults aged 18 and over.